I am hereby declaring my fondness for the word 'chump' and all its possible variations - chump, Chumpington, chumpiness, chumpion. Love it. I also love Sublime Stitching patterns. It was only a matter of time before the two came together in glory. Turns out it was an adorable bird and banner pattern from the Stitch-it Kit, which I had for years before actually stitching it on anything (shame on me). It was a few years ago, and I can't quite recall if the desire to use the pattern or to create a door hanging came first - but it hardly matters now. I couldn't very well just write 'Welcome', could I? Of course not! 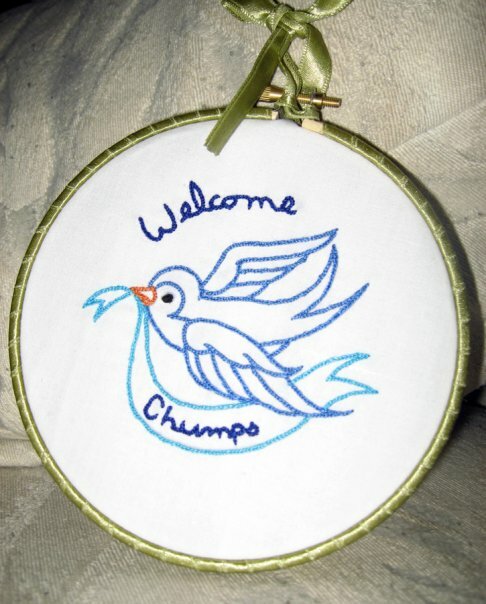 And so the first Welcome Chumps bird was born, and it was a hit. A friend was so taken with the little fella that she requested one for Christmas, and I obliged. Honestly, I really wasn't thrilled with the colour choices on the first version, and felt there was a little sloppiness (or bulkiness, maybe?) to some of the stitches, so I welcomed the chance for another shot. I decided to to simplify things in the to-be-gifted version, going with blues rather than multicolour, and was extremely pleased with the results - and i like to think that the recipient was, too. So, where does this bring us? Well, we just bought our first house and will be moving in at the end of April (I'll save the gushing for another post - you've been warned), and of course the door requires it's own Bluebird of Chumpiness. How else will my chumps know they are welcome? Obviously I can't copy my friend's version exactly - though I do love the blues. I was debating reds, but Cardinal Chumpington doesn't quite have the same ring to it. What do you think? I will post the finished project when it's ready. okay a) why didn't you tell me you had a blog?! I was pretty quiet about the blog start up - mostly because I wasn't sure I'd keep up with it, and also didn't expect it to be any good.